Several times the little guy tried to climb the hill, but just couldn’t seem to make it. Mom stood close by, and even though she could easily have pushed her baby elephant up the slope, she seemed to be watching instead. After a few tries, the tiny, big-eared, adorable little fella sat down as if he was going to cry. I was surprised at what happened next. Mom seemed to be explaining something to her little charge as he appeared to be on the verge of tears. Slowly he perked up and walked around his mother, then under his mother, then she patted him on his back with her trunk, over and over again. Surprisingly they allowed me to get closer than I’d expected. It felt as if I was eavesdropping on a tender moment. But the love and affection in a beast the size of a bus amazed me. Somehow God has instilled motherhood into females of many species other than humans. It was important enough to God to make sure the imprint of parenthood was implanted in mothers to care for their young. 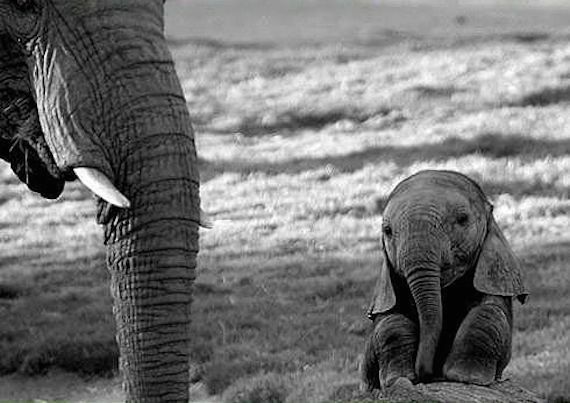 When I think of the times that God has allowed me to sit and sulk, and then come at just the right time to lift me by my bootstraps, I feel very much like that little elephant calf. Instead of God carrying me everywhere, He teaches me to climb. Rather than giving me whatever I want, He helps me to see what I should want. It is parenting at it’s finest, and He takes the time to invest in me. God cares enough about us to give us the experiences we need, the strength we require, and the attention we demand. But He gives us more than that—he gives us the love we need too. As the mother elephant started up the hill, she turned and looked at her little one. Slowly he walked past her, then started up the hill looking back frequently to see if she was there. When they reached the top, he jumped at her side—he jumped! I didn’t know elephants could do that, but they can. In the middle of Africa, God taught me a lesson when I was all by myself. He cared enough to reach down to me when I needed him. He cares about all of us that way. God is faithful, all the time. He has a plan, and it’s pretty stinking exciting.